The author discusses the archaeological evidence for an Aegean Minoan maritime colonization of southeastern Iberia. The primary causal factor for this was the development of the alloying technology of arsenical copper. The alloy's hardness and castability made the woodworking tools of the saw, bow drill, and lathe possible. These tools set the stage for the invention of the first efficiently produced planked wooden ships with keels in the Aegean that set out on voyages of exploration early in the 4th Millennia B.C. in search of the prestige metals of gold and silver resulting in the Los Millares culture in southeastern Spain. The discourse begins with the first archaeological evidence of human travel on the open sea before 9000 B.C. 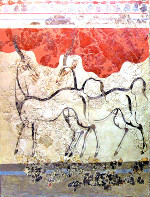 and continues with the development of the Aceramic Anatolian and Natufian Neolithic package, the radiation of the Aegean Neolithic package, the rise and fall of the Millaren culture, the Atlantic Tin trade with Britain during the Bronze Age, and ends with the catastrophic collapse of the Aegean El Argar culture in about 1350 B.C. The First Evidence of Human Travel on the Open Sea before 9000 B.C. 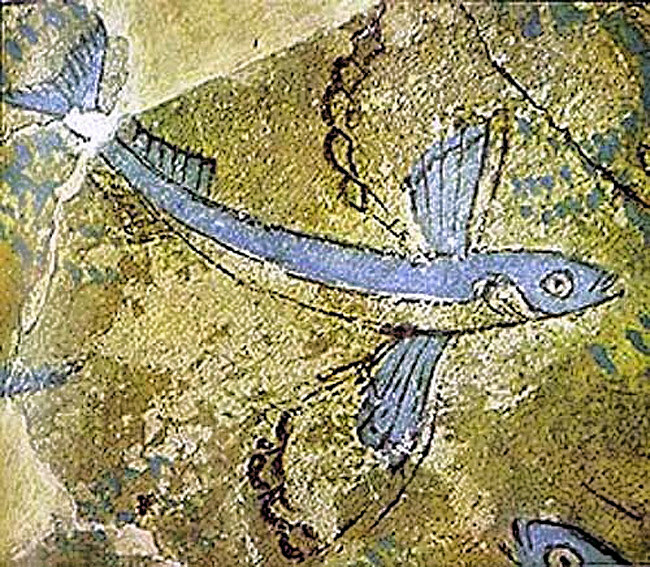 The earliest archaeological evidence of human transport over the rough open sea that is known to me is the Akrotiri Aetokremnos rock shelter occupation site on the southern coast of Cyprus (Swiny 2001). The remains of the site associate humans with burnt bones of the pygmy hippopotamus. Before this time Cyprus was inhabited only by the indigenous Pleistocene fauna. While sea level would have been lower at this time the minimum distance from the coast of Cyprus to the mainland of Anatolia would still have been about 65 km. The undeniable deduction is that some form of raft or boat must have been used to transport the humans to the site. 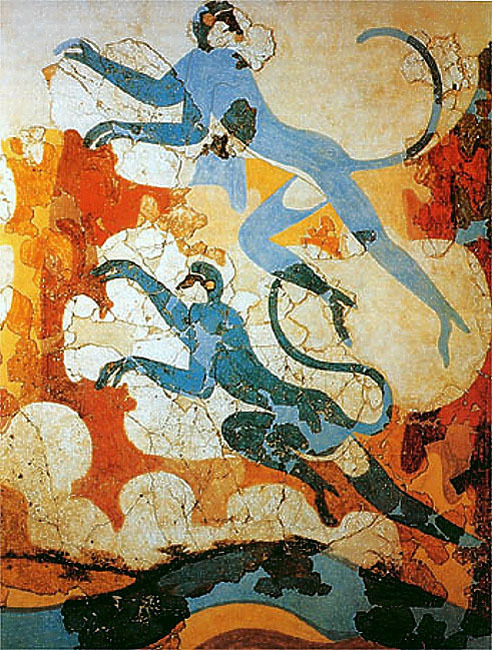 Akrotiri Aetokremnos is dated to the late Pleistocene in the 10th millennia B.C. A raft is a device that relies on the floatation of the material (typically wood) used to construct it. For any given carrying capacity a raft is much heavier and more unwieldy when compared to its boat equivalent. This makes them extremely difficult to directionally navigate in the current and winds of the open sea. A typical boat relies on its shape to provide buoyancy from the water it displaces and minimize the lateral forces of the current and wind on its hull as it moves through the water. This allows its crew to more effectively control and maintain a predetermined course. If you want to reliably paddle or row a craft to a destination and return, you need the control that some form of a boat provides. The early maritime explorers of Cyprus may have used boats constructed with a skeleton of wood covered with sewn animal skins, but boats of this kind are much more vulnerable to the rough and stormy conditions of the open sea than well-built wooden ones. Skin boats work well enough in rivers and near land along the coast, but one split seam can be deadly when out at sea far from land. It is possible that strong sea-worthy wooden boats sculpted with stone tools and fire and stitched together with the fibers of hemp or yew wood were navigating the eastern Mediterranean Sea well over 11,000 years. 11000 B.C. to 6000 B.C. The basic technological assemblage that comprised the Neolithic package developed between 11000 B.C. and 7000 B.C. 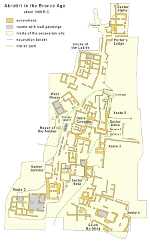 in places like Tell es-Sultan (Jericho) in the Levant among the Natufians and Pinarbasi in southwestern Anatolia. This was an amazingly innovative and creative period in human recorded history. For the first time large groups of people came together in an interdependent way to solve their problems of survival and to improve their quality of life by settling permanently in areas of natural abundance. The specialization of productive labor that spread its benefits to everyone is perhaps the greatest revolution in human socialization. 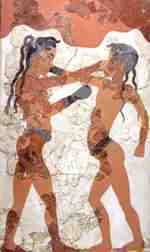 In about 10200 B.C. houses were being built in Hallan Cemi Tepesi in eastern Anatolia where they used stone incised bowls and made extensive use of wild plants and animals. The site has some of the earliest evidence of possible pig domestication. 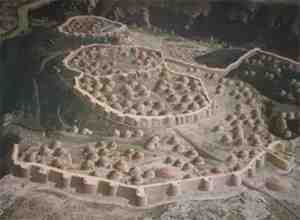 The settlement of Cayonu was formed in 8500 B.C. in southeastern Anatolia and developed elaborate buildings with terrazzo floors. 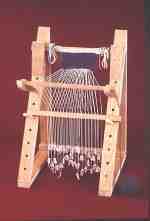 They used awls and fishhooks of cold-hammered native copper, and show the earliest evidence of the possible use of flax to weave linen textiles. At about this same time Nevali Cori built monumental stone structures that were probably shrines. After 8000 B.C. Asikli Hoyuk became a real town surrounded by a city wall with a large obsidian industry. Over the next 2,000 years these trends toward urbanization culminated in the settlements of Catal Hoyuk and Can Hasan in Anatolia. While maintaining the Mesolithic practices of hunting, fishing, and gathering they began to systematically cultivate crops of wheat, barley, rye, flax, legumes, peas, and vetch (faba beans). They domesticated sheep, goats, pigs, and dogs and would begin the process of domesticating cattle (Bos Taurus) which provided them with a stable and reliable source of food, raw materials, and labor for the fields. The domestication of the large Anatolian Aurochs would be completed sometime between 6500 and 6000 B.C. Their toolkit included flint and obsidian blades and bladelets, polished stone celts (axes), grinding stones and mortars, and harpoons and fish hooks of bone. The Anatolians developed stone and mud brick architecture, basketry, and works of leather and the Natufians had stone shaft straighteners indicating the use of spears or archery. 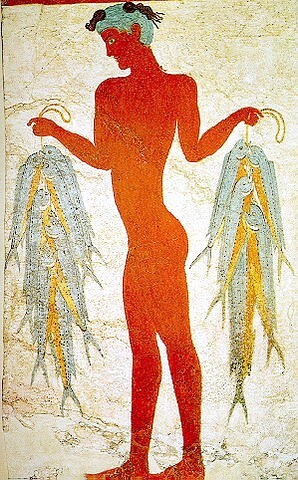 The Origin of the Aegean Minoans - 7000 B.C. By 7000 B.C. the Neolithic culture at Catal Hoyuk that worshipped the Mother Goddess and Sacred Bull spanned Anatolia from Cayonu in the east to Hacilar in the west and boldly reached over the sea to Khirokitia on Cyprus and, more profoundly, to the hill of Kephala (Knossos) on the Aegean island of Crete. 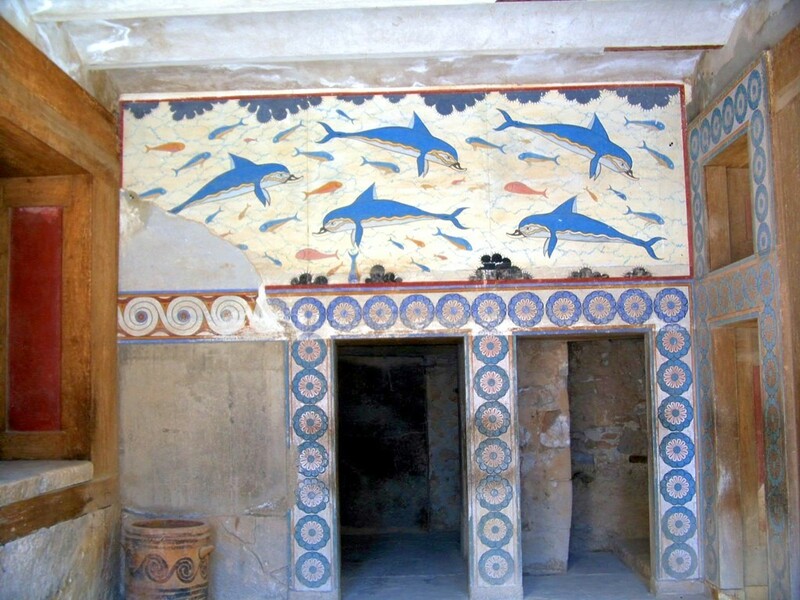 The Knossos settlement near the coast of north-central Crete represents the origin of the Minoan civilization. Before this time Crete was, like Cyprus before Akrotiri Aetokremnos, uninhabited by humans. There can be no arguments of any indigenous development here. This is unquestionably a case of Anatolian maritime pioneer colonization. The boats they used must have been built of solid wood and quite durable with a cargo capacity of, at least, a few tons in order for the crew to transport their domesticated sheep, goats, provisions, and passengers. None of the domesticated animals the Anatolians brought with them to Crete had ever existed on the island before. 7000 B.C. to 6000 B.C. At the time the first settlers set foot on Crete, the island was carpeted by vast ancient forests of old-growth Cypress trees. Many of them were over 40 meters in height with very thick trunk diameters. It must have been a very arduous and time-consuming task for woodcutters to take down one of these trees with their polished stone axes. 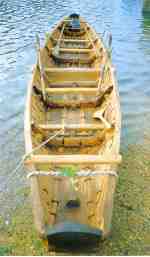 Cypress is an excellent wood for boat building and is still used for that purpose today. It is relatively strong yet light and flexible and is naturally repellent to insects. Its best feature from the point of view of a crewman of a Cypress boat in distress out at sea is that the wood floats in water. Under normal conditions a Cypress boat or ship will not sink. A person alone out at sea far from land stands little chance of surviving, but if they could cling to their swamped, yet still floating, ship they have a good chance of eventually making it to safety. 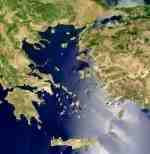 The Aegean Sea has over 1,400 islands and islets, many of which are within sight of one other. This makes it a natural incubator for naval and maritime technological development. The strong north winds and uncompromising gales of the Aegean are well known and must have been quite a challenge for any ancient boat builder. 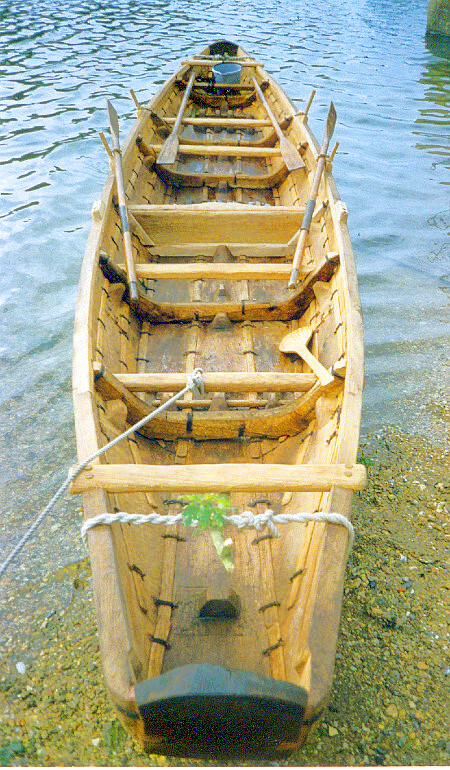 Given the rigors of the Aegean and the abundance of huge Cypress trees, human innovation, over the next 1,000 years, must have transformed the vessels of the initial colonization into large rugged sea-going stitched wooden ships that were capable of transporting their newly domesticated cattle in wooden pens. 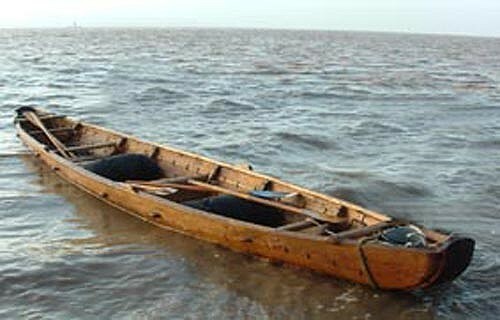 They were probably similar to the Ferriby Boats from Britain dated to about 1800 B.C. They were constructed of thick Cypress planks sculpted with fire and stone tools (axe, adze, chisel, awl, etc.) and stitched together with yew fibers. Theoretically, some of these strong durable boats could have easily exceeded 30 meters in length and may have used a sail made of animal hide. With or without the use of the sail, they were powered primarily by human muscle working the oars and tiller. A 30 meter ship of this type could have been propelled by well over thirty oars and carried a cargo of 30 to 50 tons. By 6800 B.C. the Argissa settlement appeared in Thessaly on the mainland of Greece. It was soon followed by establishment of Sesklo in about 6500 B.C. together with the Araptepe-Bekirlertepe settlement north of the Bay of Izmir in the eastern Aegean. Within about five hundred years (6500 B.C.) 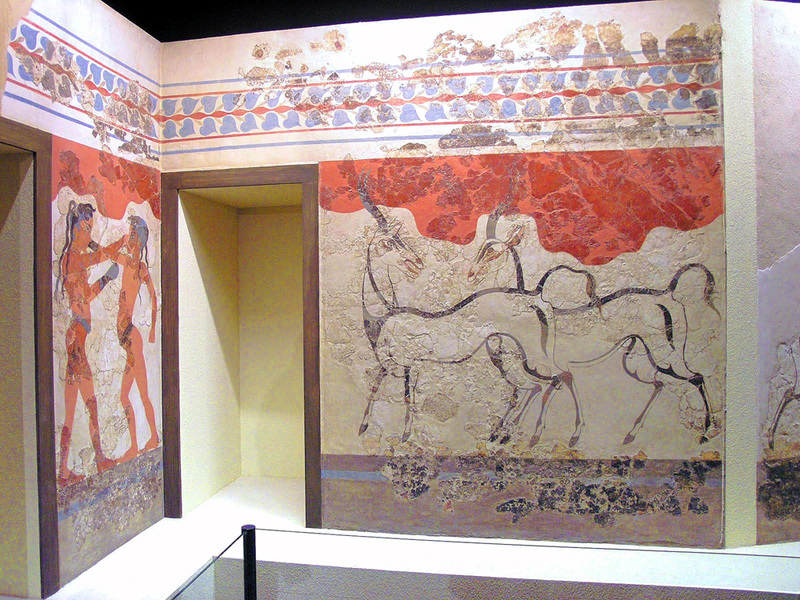 of the settlement of Knossos the Anatolian Neolithic package had moved into the Mesara Plain of south-central Crete. The seaport settlement of Kommos was founded on the coast to the west of the plain at about this time. The settlements of Nea Nikomedeia in northern Greece and Karanovo in Bulgaria and Thrace appeared in about 6200 B.C. In the timeframe of 6000 B.C. Emporeio on the island of Chios in the eastern Aegean was founded, but Khirokitia on Cyprus and Pinarbasi in Anatolia seem to have been abandoned. Hacilar in southwestern Anatolia would continue on for another 1,000 years of occupation before finally collapsing. Also, the Neolithic Package reached the Franchthi Cave settlement on the Argolid Gulf in the Peloponnese in about 6000 B.C. Franchthi Cave had been occupied for at least 14,000 years before the arrival of the Neolithic. 6600 B.C. to 6000 B.C. Pottery began to appear in Thessaly and Catal Hoyuk around 6500 B.C. The invention of pottery solved several problems for the Neolithic people. It enabled them to securely store large volumes of water and other liquids in something other than a laboriously made stone vessel or flask or bladder of sewn animal skins. Water is quite heavy and a bladder's ability to securely and reliably hold it is limited. It also allowed them to store grain and other food products much less expensively while keeping them relatively free from contamination and insects. Once pottery found its way to Crete among the builders of the cattle-carrying ships, they must have immediately realized that they could now economically provision their vessels for significantly longer voyages without exhausting their supplies of water and food. The invention of pottery, the domestication of cattle, and the development of large durable wooden ships completed the Aegean Neolithic assemblage that would soon spill into Europe through exploration, colonization, and the assimilation of the local Mesolithic peoples by two main routes. The southern route was predominantly taken by shipping from the Aegean that worked their way west along the northern coastlines of southern Europe using the Mediterranean Sea as a highway. The northern route rapidly spread into central Europe using the Danube river basin as its highway. The southern radiation is known as the Cardium Pottery or Cardial culture after the incised Aegean pottery carried on their ships, much of which was imprinted with the shells of the marine mollusk Cardium edulis. The northern Danubian expansion of the Aegean Neolithic is mainly represented initially by the Karanovo culture and then by the almost simultaneous appearance in about 5600 B.C. of the Vinca, Cucuteni, and Linear Pottery cultures in southeastern Europe. All four of these cultures were based on the Aegean Neolithic package and directly linked to it. 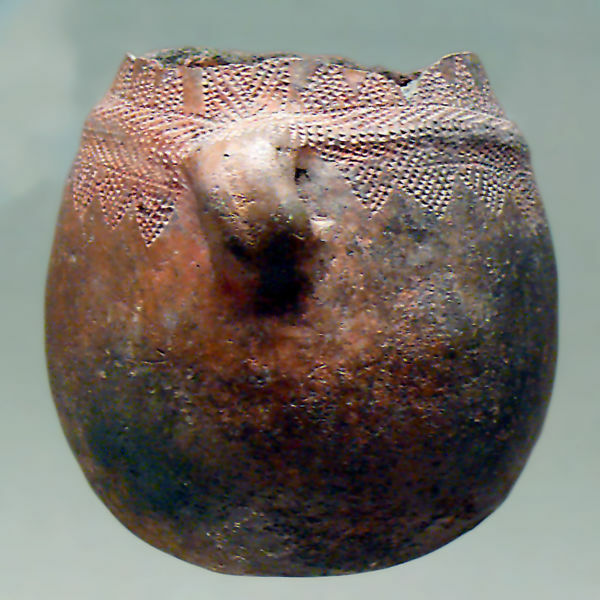 While the Karanovo, Vinca, and Cucuteni generally remained in the southeast, the Linear Pottery culture led the advance up the Danube into central Europe. Mysteriously, after a rapid advance over the next few hundred years the Aegean Neolithic's march to the northern coast of Europe was suddenly halted and the southern route's advance also stopped after reaching the Atlantic coast of Iberia (Portugal). The only viable explanation for this is that there must have been large populations of Mesolithic people inhabiting the coastal regions of northern and western Europe that actively resisted any further colonization, assimilation, or acculturation (Price 2000). The first archaeological evidence of Aegean settlement in Iberia is the appearance of shards of Cardium incised pottery around 5600 B.C. (Price 2000). This pottery is also referred to as Cardial or Impressed Ware. Cardium pottery has been found from the Levant in the eastern Mediterranean to the Atlantic coast of Iberia (Portugal). When the Aegean Neolithic package arrived in Iberia it included the same stone and bone tools, cultivated crops, and breeds of domesticated sheep, pigs and cattle when it started its advance a few hundred years earlier (Zilhao 2001, Pereira 2006, Kennett 2006). The settlement of the Iberian coastlines seems to have been a relatively non-violent process of both pioneer maritime colonization and inland diffusion to the indigenous peoples until the sudden halt of its advance on the Atlantic coast. The Iberian settlers lived in caves, rock shelters, and open-air settlements like La Darga in Catalonia (Price 2000) with structures estimated to be 3 to 4 meters high with several hearths. In Cabecicos Negros they built small structures made of stone and mud with roofs of vegetation. They used tools of bone, polished stone axes, wood diggers, sickle blades, and stone hand mills. They produced stone projectiles, pottery, basketry, leather work, and produced flour with their mills. 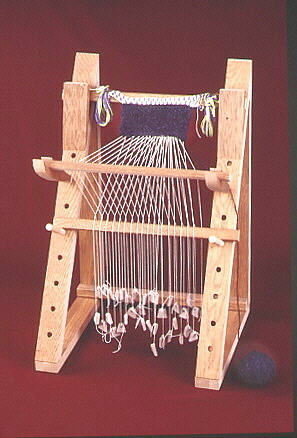 Textile production was limited to small looms, as evidenced by weaving thread separators, similar to the backstrap type. 8500 B.C. to 4000 B.C. Copper is one of the few metallic elements that exists in its pure form in nature (Native Copper). It is much more commonly found combined with other elements in the form of oxide or sulfide mineral ores. The oxide ores include Azurite, Cuprite, and Malachite while the most abundant sulfide ore is Chalcopyrite. Tools of pure copper can be hardened by reheating (annealing) and hammering, but there is a limit to the degree of hardening that can be achieved. 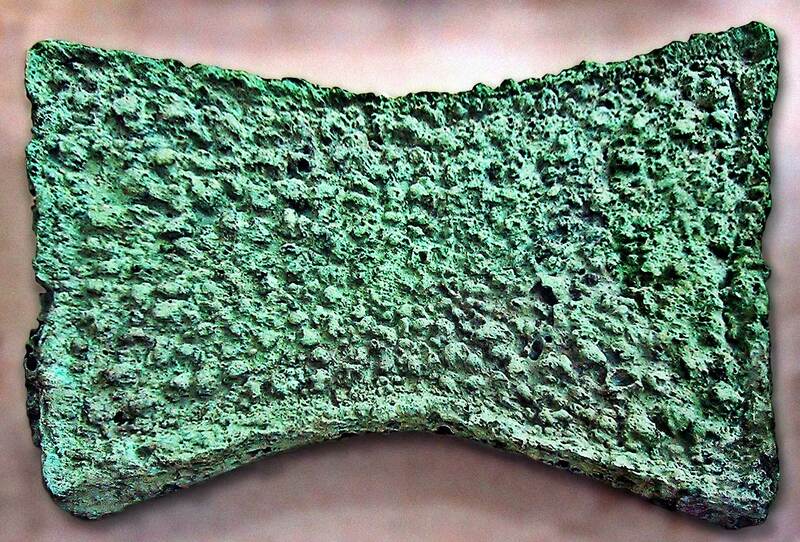 A copper axe would have been superior to its polished stone equivalent only while it retained its sharp edge. If freshly sharpened copper axes were rotated in to replace those dulled from the pounding, the work required for chopping down a tree would have been significantly reduced when compared to axes of polished stone. Implements of pure copper would have been valued as tools, but regular sharpening during usage would have been required thus reducing the life of the tool. A subtle but very important property of tools of copper is that they are recyclable. When worn out they can be returned to the furnace and recast anew. But a harder, tougher metal tool that held its edge indefinitely would have been the dream from the beginning. Several isolated finds of copper objects have been discovered from before the 6th Millennia B.C. The earliest artifact of pure copper known to me is a 2.3 cm pendant found in the Shanidar Cave located in northeastern Iraq that is dated to 9500 B.C. (Hummel 2004). The pendant was shaped by cold-hammering native copper and could have been carved with stone tools. Many objects of cold-hammered copper have been found in Cayonu in southeastern Anatolia including awls and fishhooks dated to about 8500 B.C. A single copper bead was discovered in Nevali Cori that has been dated from 8500 to 8000 B.C. Asikli Hoyuk produced several copper beads (8000 - 7500 B.C.) made from rolled thin sheets of native copper (Yalcin 2000). Several copper beads like those at Asikli have been unearthed at Catal Hoyuk dated to about 6750 B.C. (Mellaart 1967). A 14.3 cm long copper awl was found in Balomir, Romania in a context dated before 6000 B.C. (Mulhy 1996). All of this culminated in the discovery (6000 - 5900 B.C.) of a large mace head of cast native copper in the Anatolian settlement of Can Hasan (Yalcin 1998). Evidence of extensive copper working in a fully developed form has recently appeared in the Neolithic Vinca settlement of Prokuplje in southern Serbia. The unpublished site has been dated to 5500 B.C. 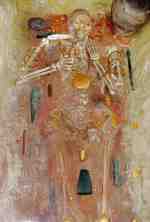 by archaeologist Julka Kuzmanovic-Cvetkovic from the Prokuplje Museum and Dusan Sljivar of Serbia's National Museum. This was not just the cold-hammering of native copper. It included the extraction of copper oxide ores from a mine located on the nearby Mlava river. The ores were transported to a local copper smelting workshop and melted for casting. The tools found included a chisel, a two-headed hammer, and an axe. By comparison the copper artifacts found at Hacilar in southwestern Anatolia in 5300 B.C. were nothing more than a few beads and pieces of pins. It appears that the origin of organized metallurgy may have taken place in the Neolithic Balkans. Between 4500 and 4000 B.C. Balkan metal workers were mining copper ores in underground shafts and galleries and they had discovered how to smelt the sulfide ores of copper as well. They were producing hundreds of axes and adzes (Betancourt 2006). The Balkans looms large over the entire Aegean Neolithic period with respect to the development of metallurgy. Metallurgy developed at a later time on Crete. There is no evidence known to me of copper, or any other, mining on the island in ancient times. Copper-bearing ores have been discovered in modern times but they are very insignificant and uneconomical. All metals had to be imported to Crete by ship either as mineral ores, processed metal, or finished products. Chrysokamino is a copper smelting site on the Bay of Mirabello in northeastern Crete excavated in 1996-97 with dates beginning in 4500 B.C. (Johnson 1996). The source of the ore smelted at Chrysokamino has not been definitively identified by provenance studies (Betancourt 2006). 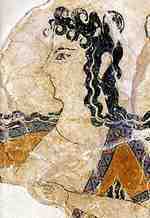 The nearest possible sources are Laurion in Attica and the island of Kythnos in the Cyclades. The site is an isolated, windswept place ideal for smelting operations. The wind would heat the furnace and blow the fumes away from the workers. During this period many new settlements were established in the eastern part of the island and in the south-central Mesara plain. Besides Laurion in Attica, Macedonia and Thrace are the only areas where significant deposits of gold can be found in Greece. The Balkans have a relative abundance of gold and silver ores especially in southern and western Bulgaria and some areas of Serbia. Silver deposits are quite rare in Greece except again for Laurion. Copper is much more commonly distributed throughout the region when compared to gold and silver and availability should not have been a factor in its development and production except in places like Crete which had no useful mineral ores at all. 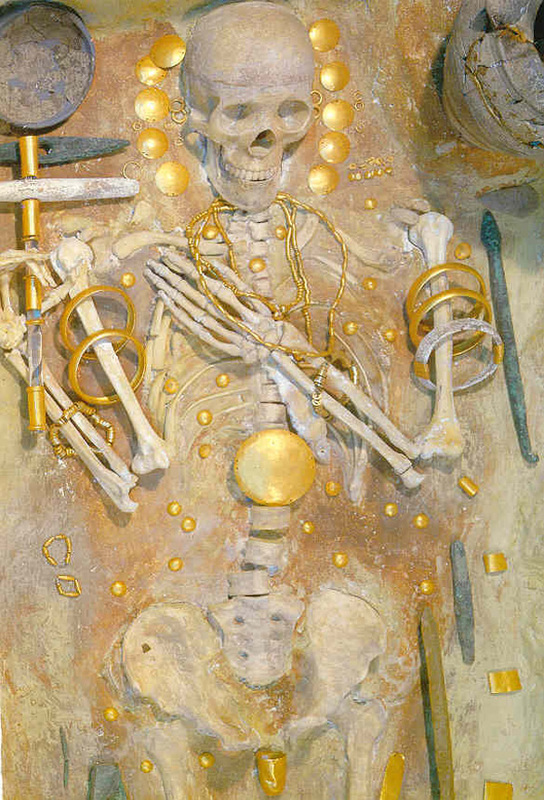 Gold beads have been excavated in Dimitra in eastern Macedonia and are claimed to be from 5500 to 5250 B.C. If confirmed they could be some of the earliest gold objects yet discovered (Betancourt 2006). A disk of gold has been found at Ftelia on the northern coast of the island of Mykonos dated from 5000 to 4500 B.C. (Facorellis and Maniatas 2002). Objects of gold make their appearance in a very opulent way especially in the period from 4250 to 4000 B.C. in the Balkans. The Varna necropolis on the eastern coast of Bulgaria has hundreds of graves. Just four of the most lavish ones contained some 2,200 golden objects (Renfrew 1986). This is an indication of the immediate and great value placed on gold by the elites of the period. Many of these objects were disks and pendants of the "ring-idol" design with a perforation in the center. This seems to have been a common theme in the Aegean and Balkans at this time. Many objects of gold and silver have been unearthed in the Aegean from 4500 to 3500 B.C. This was the period when gold and silver metallurgy emerged to robustly develop throughout the region. The evidence includes gold pendants from Theopetra cave, Anavissos, and Platomagnoulia on the mainland of Greece. Silver pendants appear in Alepotrypa cave in the Mani peninsula, Amnisos cave on Crete, and the cave of Euripides on Salamis. A hoard of silver jewelry was discovered in Gournes in Central Crete in an Early Minoan I cemetery that included bracelets and 168 beads. 4000 B.C. to 2500 B.C. Most of the Early Bronze Age was actually an age of arsenical copper (Betancourt 2006) and the distinction should be made for the sake of clarity. The advent of the controlled mixing of an alloying element (arsenic) with copper in an effort to make their tools harder was a great advance in tool making. 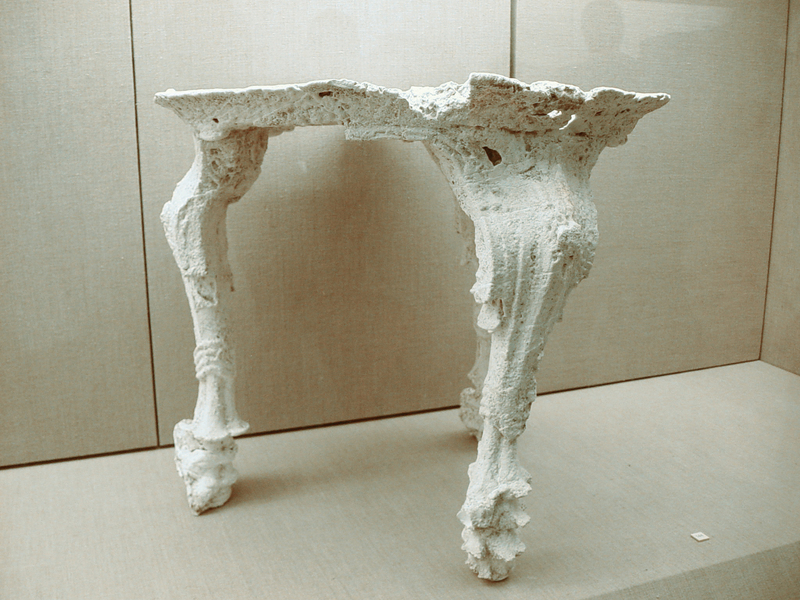 Not only did it make their tools much harder, the alloy melted at a lower temperature and its greater fluidity made the casting of complex and finely shaped molds practical. This led to the realization that they could now for the first time cast tools like the drill head and saws with sharp, hard teeth for cutting wood and stone that would stand up much better in a production environment. This was the beginning of a revolution in stone and wood working and especially ship building. The alloy of arsenical copper (nominally 1% to 6% arsenic) was related to the development of furnace technology and to the use of copper ores and not native copper (Lambert 1997). Finds of arsenical copper have been made throughout the Aegean and especially on Crete - the island with no metals of its own. Four artifacts, a dagger and three needles, surfaced in Thaurrounia cave in Euboia with an average 3.12% arsenic content (Mangou-Ioannou 1999) dated to about 4000 B.C. (Sampson 1996). Some 16 artifacts with an arsenic content of 1% to 6% have been found in an Early Minoan context in Hagia Photia on Crete (Gale 1990). These may be the earliest in the Aegean besides those in the Thaurrounia cave. Poros, a harbor town for Knossos on Crete, was an important center for the production of arsenical copper during the Early Minoan period (Betancourt 2006). 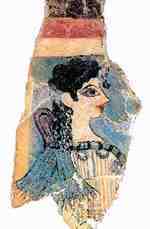 Daggers have been found in the Cyclades, Hagia Triadha, and the Pyrgos cave associated with Early Minoan pottery. Long daggers, saws, knives, chisels, and fishhooks have been recovered from the many tholoi on the Mesara plain at this time. Nine artifacts with an average of 2.9% arsenic were discovered in Petromagoula in Thessaly dated from 3700 to 3300 B.C. (Johnson 1999). Eight artifacts from the palace hoard of Arslantepe level VIA in eastern Anatolia showed an average of 4.16% arsenic (Hauptmann et. al 2002). Since the 1980's the Skouries foundry site on the Cycladic island of Kythnos was associated by pottery and radiocarbon dated charcoal found in the slag to the first half of 3rd Millennia B.C. The lead isotope analysis of the ores and slag done at that time suggested that the "fingerprint" matched many objects found in the Cyclades and the copper based artifacts found in the Minoan Mesara tombs (Platanos, Marathokephalo, Hagia Traidha, Koumasa, Kalathiana, Hagios Onouphrios, Porti) (Gale 1990) and those at Hagia Photia (Stos-Gale 1999). But this came into serious question in the 1990s by the Laboratory of Archaeometry at Demokritos in Greece when it was established that the results of Gale could not be repeated by succeeding investigations. Therefore the location of the source(s) of the mineral ores used in "any" of these copper artifacts is presently unknown (Betancourt 2006). It appears that all the copper ores smelted at Kythnos were not mined on the island. Sometime after 4000 B.C. the first effective woodcutting saws were cast in arsenical copper. This revolutionized woodworking in general and shipbuilding in particular. There must have been attempts to cast saws with pure copper but the difficulty of casting such a thin piece and the amount of sharpening required would have negated their use in a production environment. When the new saws came into use on Crete it allowed them to cut planks of wood with a consistent thickness to almost any length and width they desired. The shipbuilders must have soon realized that if they could edge-join the planks they could make significantly lighter yet still strong hulls for their ships. A lighter ship can carry more people, provisions, and cargo than an equivalent ship made by sculpting planks with the axe and adze. In the beginning they were probably stitching the planks together with yew or hemp, but in time they invented or adopted the use of the bow drill and lathe so they could more securely mate the plank edges of their hulls with locked mortise and tenon joinery. They would have to cut the round holes for the binding pegs using a drill and cut the smoothly rounded sides of the pegs on the lathe to fit them snugly into the locking holes. This very strong wood joinery technique is still widely used today. These large, much lighter ships capable of long distance travel would have placed greater importance on the use of the sail as a supplementary source of power to increase their efficiency. Great distances can be traveled by rowing ships primarily powered by human muscle if their average speed is sustained over time. If you assume that such a ship could maintain an average velocity of eight kilometers per hour, which is a brisk walking pace for most humans, and maintain it constantly around the clock by rotating the work at the oars in shifts among the available men on board, the ship would travel 192 kilometers in 24 hours. The rowing distance between Kommos, Crete and the southeastern coast of Spain is approximately 2,400 kilometers. This distance could be traveled in 12.5 days using these parameters. The manpower requirements of such a ship would be, at least, double the number of oars to be worked. A ship with 40 oars would probably need to be manned by something like 100 crewmen to maintain a good constant rowing pace. Once the first of their large planked Cypress ships took to the seas there was nothing anywhere else in the world that could compete with them either economically or militarily. The Aegean Minoans were the first true masters of ship construction and the use of the movements of the Sun and North Star(s) to determine their latitude were well understood allowing them to confidently navigate on the open sea. Their skills in navigation were not exceeded until John Harrison's invention of the marine chronometer in the 18th century A.D. that allowed ships at sea to accurately determine their position's longitude. The Minoan technological maritime and naval advantage was so great that they would eventually come to dominate and impose their will on all shipping in the entire Mediterranean Sea including the Black Sea. Their commercial shipping was probably unopposed, except by pirates, anywhere they traveled in the Mediterranean until the massive eruption of the Theran volcano (Santorini, Greece) in about 1630 B.C. 3800 B.C. to 3200 B.C. The western Mediterranean area is much more heavily mineralized than in the east except in the Balkans and northern Greece. Over time their ships would have come to a place in the western seas that provided them with all the valuable mineral ores they had so little of and could ever desire. That place was southern Portugal and Spain. This is the location of the renowned geological formation known as the "Iberian Pyrite Belt". It is one of the most heavily mineralized places on earth with an abundant supply of the prestige metals of gold and silver as well as copper and tin that is still being mined to this day. The new Cypress ships must have been a source of amazement wherever they were sighted by the coastal Neolithic peoples. During the time since the completion of the spread of the Aegean (Cardial) Neolithic package, local and regional coastal maritime trading was active as well as the influx of new settlers every year from the eastern Mediterranean. 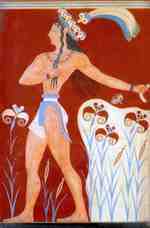 The Minoans probably began exploring the shores of the Mediterranean for mineral ores between 3900 and 3700 B.C. and arrived on the eastern coast of Iberia during this time. At least one person on these ships of exploration would have been keenly observing the beaches and rivers along the coast for the glittering signs of alluvial gold in the sands and sediments. If gold was found at the mouth of a river they would know that somewhere up that river would be the quartz-bearing ores that produced it. The same would be true for silver with its mineral ores of Argentite and Acanthite and the brightly colored ores of copper (Azurite, Cuprite, and Malachite). Aside from their ships, the use of metals, and their Mesaran Crete funerary practices they would have used the same Neolithic agro-pastoral technological package as the indigenous Iberians. When they surveyed the river basins of Almeria in southeastern Spain they found everything they were looking for. For several centuries they probably would have been satisfied to sift the alluvial sediments for metals and established settlements in the river basin areas. Eventually, they would have moved up to the inland sources of the alluvial metals to form permanent mining settlements and that's exactly what they did. By 3200 B.C. 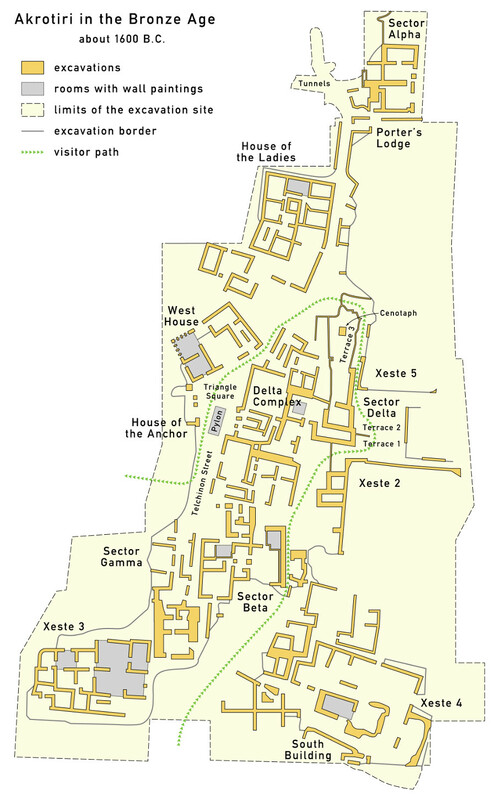 many of the fortified towns of the Aegean Minoan colony (Los Millares culture) had been founded and all of them were directly linked to mining operations or their defense (Almizaraque - Silver, El Barranquete - Gold, El Tarajal - Gold and Silver, Los Millares - Copper, Los Pilas - Gold, etc.). Before the early radiocarbon dates for the Millarens were confirmed, many scholars mistakenly believed that the culture was the result of Mycenaean colonization and associated their tholos tombs with the famous circular tombs at Mycenae in Greece from the Late Bronze Age. The Myceneans would not come onto the scene until much later. So it is understandable that many of today's scholars believe that Iberian metallurgy was an independent invention of the indigenous Neolithic people. But this can't be correct. Besides the obvious selection of settlement sites directly associated with the Eastern Mediterranean prestige metals of gold and silver, there appears to be no discernible period for the exclusive use of purified copper by the Millarens as seen in the east where it truly did originate. In about 3200 B.C. Otzi the Iceman was still using the old technology of pure copper (axe head - 99.7 % pure copper) while the Millarens were working with the advanced Aegean alloy technology of arsenical copper. This does not speak well for the indigenous origination of Iberian metallurgy. While artifacts of relatively pure copper are found among the Millarens they appear to be contemporaneous with those of arsenical copper. 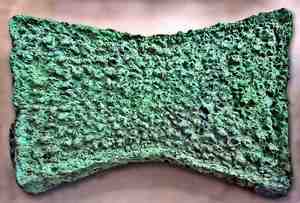 The Millarens seem to have bypassed the "Age of Pure Copper" and began with, at least, a basic understanding of the alloy technology of arsenical copper from the beginning. 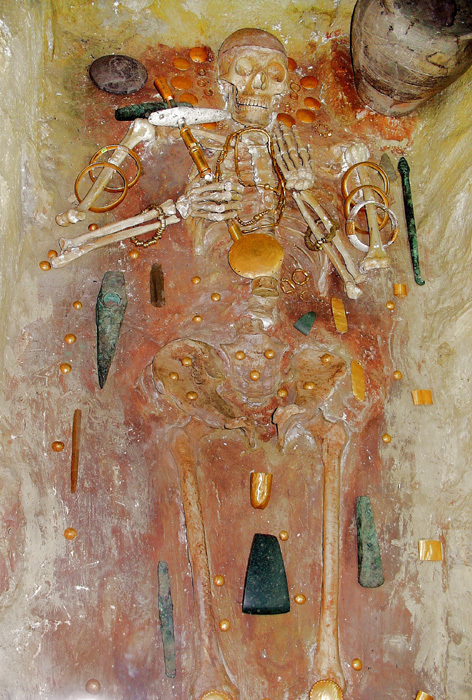 Twenty-seven copper artifacts from the Los Millares site have been found to contain an average of 2.3% arsenic and sixteen objects from El Malagon had a concentration of 1.7% arsenic (Lambert 1997). The most probable conclusion from this evidence is that there was no indigenous origination of metallurgy in Iberia. It was the direct result of Minoan maritime exploration and pioneer colonization. 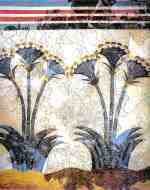 Many of the towns and settlements of the Millarens had cemeteries consisting of tholos (beehive) tombs. 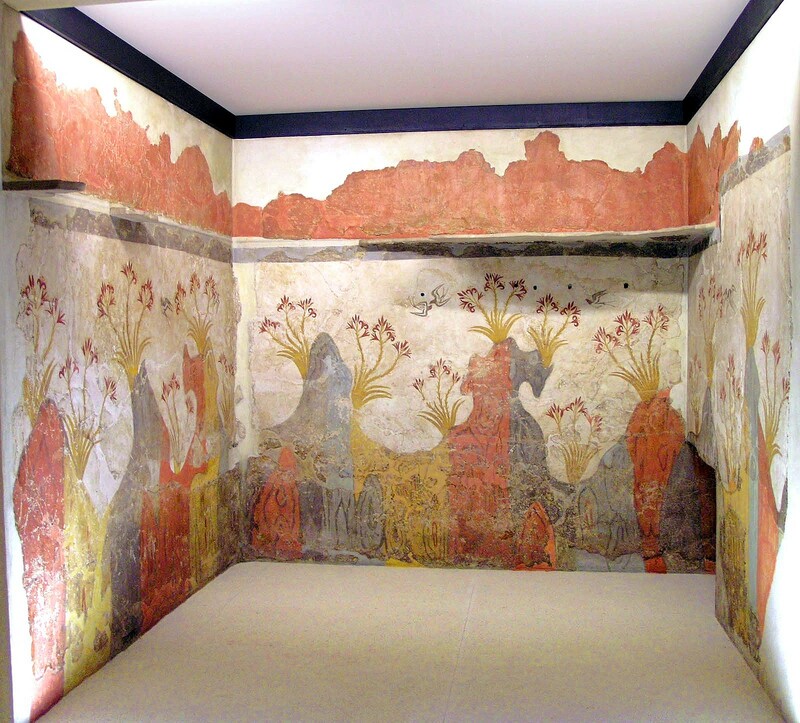 Los Millares had a necropolis of some 90 tholoi built in the distinctive style of the Early Minoans of the Mesara plain in south-central Crete that were used by the elites of the society. 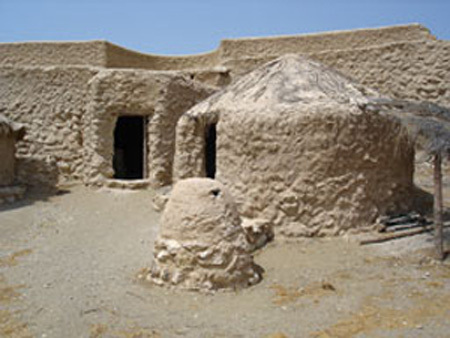 The first evidence of tholos building techniques is the mud brick "Tholoi of Arpachiyah" of the Halafian culture in northeastern Syria which lasted for about seven hundred years in the 6th Millennia B.C. 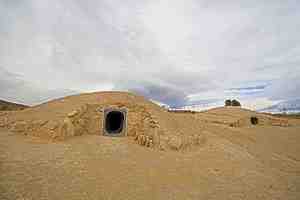 But they appear to have been used for domestic or ceremonial purposes and not as tombs. 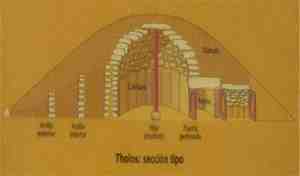 The next appearance of tholos construction is in Lebena in southern Crete in the 4th Millennia B.C. This was at a time when caves and rock shelters served as the primary means of burial of the dead on the island. 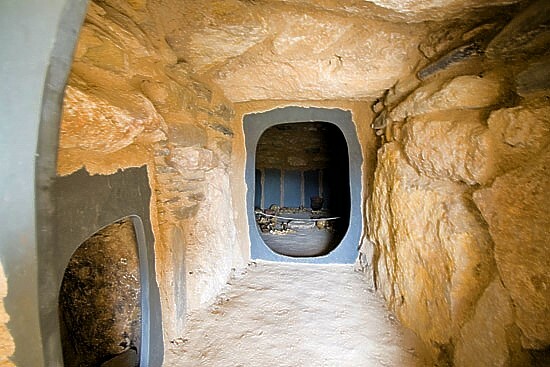 Tholoi became the only commonly used method for burial in southern Crete for well over 1,000 years with some tombs still being used into the Late Bronze Age. A typical Cretan tholos tomb was circular, constructed of unworked fieldstones, and built above ground. 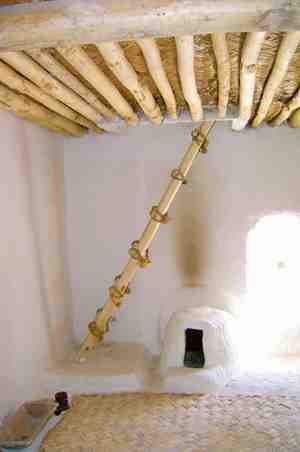 The interior walls were corbelled to slope inward in an arched beehive-shaped fashion to enclose the space near the top. How the roof was capped is still a matter of debate. A passageway led to a small doorway that consisted of a trilithon of two vertical standing stones capped by a horizontal lintel. The door opening was closed with a slab of stone on the exterior. Rectangular rooms or annexes were often built adjacent to the outside wall of the tombs. The appearance of Minoan tholoi among the Millarens is certainly more than just a curiosity. The idea of the spontaneous origination of this very unique style of funerary structure in Spain at the same time they were being built and commonly used by the Aegean Minoans on Crete is highly improbable. This is additional strong evidence for the colonization of southeastern Iberia by Minoan maritime pioneers in search of wealth. 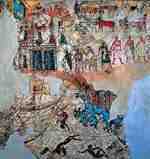 There is no reason for the Minoan explorers to have halted their endeavors in southeastern Iberia. Their new ships were certainly more capable of traveling in the ocean that the stitched boats that reached the Atlantic coast of Iberia during the Aegean (Cardial) Neolithic period. They would have simply continued to methodically scour the Atlantic coastlines and river valleys for evidence of metals to the north and south once they had passed through the "Pillars of Hercules". Notably, there is evidence from the analysis of alluvial sediments that the vast Rio Tinto copper, silver, and gold mines in southwestern Spain, north of Huelva on the Atlantic coast, began to be worked during the 3rd Millennia B.C. (Nocete 2005). The nearby, smaller Sao Domingos and Tharsis mines that are quite close to Rio Tinto may have also been discovered at this time. It is highly probable that the Rio Tinto ores were originally mined by the Millarens, but I know of no archaeological finds at the site. After 5,000 years of mining, the Rio Tinto area is one of the most cratered, destroyed, and polluted places on earth. Apparently they found no metallic ores of interest south of the Pillars of Hercules along the northwestern African coast. But the sediments of the northern coastlines of western Europe would have yielded the alluvial evidence of abundant metal ores. They may have discovered the gold, silver, and tin in Brittany in northwestern France before making the discovery of gold, tin, and other metals in southwestern Britain and Wales. Even though the superior alloying properties of tin with copper were unknown at this time its availability should have noted by the explorers. Also, there were deposits of gold, silver, and copper in Ireland. The explorers may have discovered the Canary, Madeira, and Azore islands and traveled far beyond, but I know of no archaeological evidence to support this. 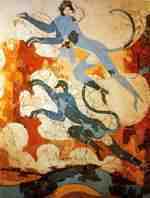 How far the Minoan voyages of discovery went north from the Pillars of Hercules along the coastlines of Europe can only await future archaeological evidence. 3200 B.C to 2600 B.C. 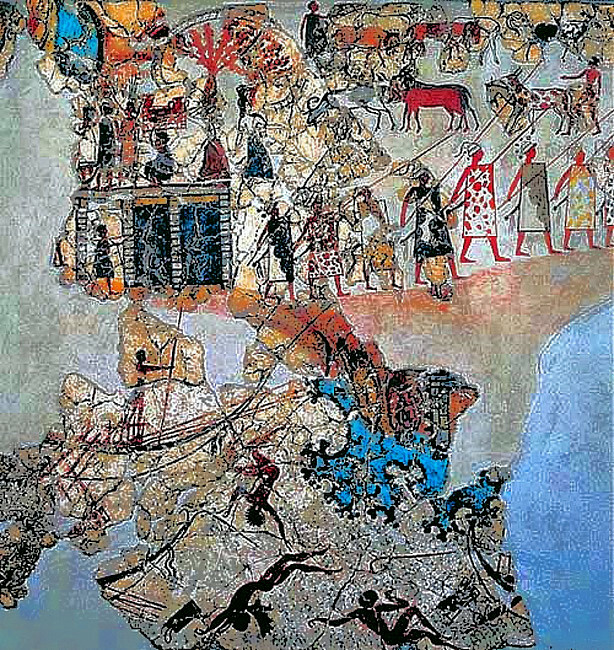 The "Los Millares Culture", also known as the "Culture of the Thousands", eventually covered an area of about 20,000 square kilometers along the southeastern coast and possibly the lands to the west around the Rio Tinto mines north of and including the modern city of Huelva on the southern Atlantic coast. The town of Los Millares was a large copper mining settlement of over 1,000 people about 17 km north of Almeria on the southeastern coast near Santa Fe de Mondujar that was discovered in 1891 by Luis Siret. 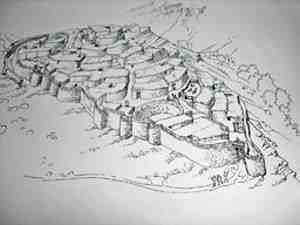 It was protected by several outpost forts and used concentric rings of defensive stone walls. There must have been considerable resistance to this foreign incursion from the indigenous peoples. The period of 3000 B.C. to 2600 B.C. was the height of the Millaren Culture. There was an expansion of the town's walls and fortifications. There is evidence of maritime trade with the eastern Mediterranean from the remains of pottery, hippopotamus ivory, and ostrich eggshells. The distribution of accumulated wealth would have been uneven from the beginning and led to the development of social stratification and economic elites that justified their status with rituals and symbolism. The hierarchical nature of the society was demonstrated by the privatization of property and the presence of prestige objects found in the graves of the elite. There is evidence for the existence of an early form of nation state with centrally controlled commercial networks. 2600 B.C. to 2200 B.C. 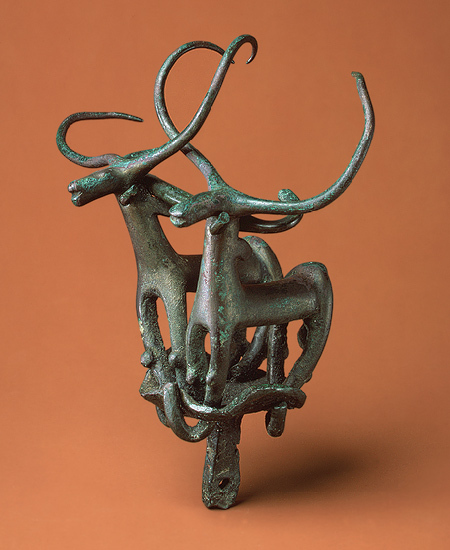 True bronze (copper with 6% to 15% tin) began to rise to dominance over arsenical copper as the metal of choice among the Aegean Minoans by 2600 B.C. and became one of the essential ingredients of their economy. Many scholars believe that the change to bronze from arsenical copper was because of the arsenic's poisonous effects on humans and this may be true to an extent, but bronze is a superior metal and is significantly harder than arsenical copper. Tin is rare and sparsely distributed geographically relative to the sources of gold, silver, and copper. Cassiterite and stannite are the main mineral ores of tin. Cassiterite is the primary (oxide) ore of tin and like gold can be found in alluvial settings. Stannite is a secondary sulfide ore of tin. The ores of tin are very rare in the eastern Mediterranean. The only known source of cassiterite in the area was the mining town of Kestel-Goltepe in the Taurus mountains of south-central Turkey. It was occupied and supplying tin to the east from 3290 B.C. to 1840 B.C. when the ores became uneconomical or ran out. Cassiterite was abundant in the west in places like central and western Iberia, Brittany in northwestern France, and especially Cornwall in southwestern Britain. During the period of 2600 B.C. to 2400 B.C. there were signs of stress beginning to appear in the Millaren culture. 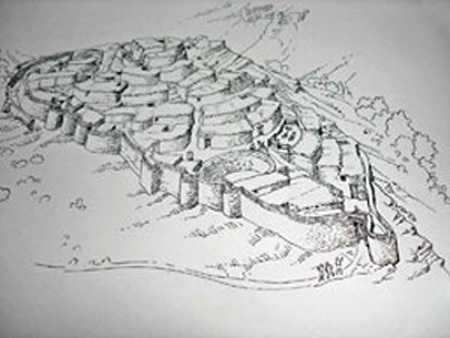 Their fortifications were reinforced and enlarged to their maximum extent indicating violent encounters or war with the neighboring peoples from the west and north of them. It was in this period that the first Maritime Bell Beaker pottery appeared among the Millarens. The pottery spread quickly throughout the region on the existing maritime trade networks. By 2400 B.C. the social stress facing the Millarens began to worsen into a crisis and the large settlements began to depopulate. 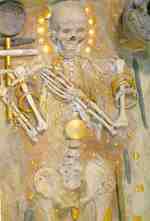 The graves of the elites were increasingly accompanied with weapons indicating the violent nature of the time. By 2200 B.C. the town of Los Millares was abandoned after a sequence of catastrophes (probably large-scale warfare). There is evidence of widespread fires and damage to the fortifications. 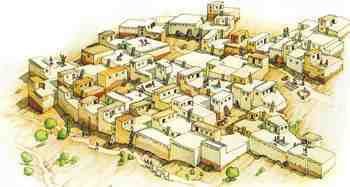 But amid the destruction, the first settlements of the El Argar arose to take their place. The period began with the use of bronze in the Aegean in 2600 B.C. and ended in 2200 B.C. with it being used by the Beaker people in Britain. The whole of Iberia was populated with different groups of Beaker people by 2600 B.C. that faced the borders of the Millarens in the southeast. If there was a war involving the Millarens it may have been a civil war rooted in the hierarchical nature of the society, but it was more probably a war with one or more of the Iberian Beaker groups over access to resources. 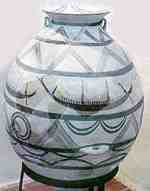 The Bell Beaker Package of technologies most probably originated in Iberia sometime after 3000 B.C. and over time spread northward along the Atlantic and Mediterranean maritime trade routes into the coastal regions of France, Britain, Ireland, the Netherlands, Denmark, and eastward into the interior of central Europe. These were the people that erected the first stones at Stonehenge in about 2600 B.C. The earliest known copper mining in the British Isles was in Ireland at Ross Island in Killarney in about 2400 B.C. It is interesting to note that the three small knife blades found in the grave of the Amesbury Archer near Stonehenge in southern Britain dated to about 2300 B.C. were cast with purified copper that came from France and Spain. This is the same technology used in Otzi the Iceman's axe head almost 1,000 years earlier. Britain was still in the "Age of Pure Copper" in 2300 B.C., but by 2200 B.C. bronze was available and in use. There was, essentially, no "Age of Arsenical Copper" in Britain and by 2000 B.C. bronze was being used in Brittany and Ireland. A short time later the huge deposits of copper ore at Great Orme near Llandudno in northern Wales began to be seriously mined in about 1860 B.C. Just as in modern times where oil is a primary commodity necessary for the functioning of the world economies, tin was a primary commodity in the Bronze Age. There were three sources of tin available to the Aegean Minoans before 1840 B.C. - the tin from faraway northeastern Afghanistan, ores from the Kestel-Goltepe mines in south-central Turkey, and the vast amounts of tin in the west (Iberia, Brittany, and Cornwall). In about 1840 B.C. the Kestel-Goltepe mines shut down and tin from the west became more important. The Minoans would have totally monopolized the supply of western tin into the eastern Mediterranean with their navy and shipping. The nearest tin ores available to the Millarens in 2600 B.C. in Iberia were in the areas of Cardenas and Madrid in central Spain (mindat.org). The stress that began to build in the Millaren society at that time may have been due to their attempts to gain access to these resources of tin. The Beaker groups affected by this policy may have been highly resistant to any incursions into what they considered their lands. Rather than have the Millaren colony fall to its complete destruction in 2200 B.C. and be faced with the inevitable loss of Iberia's vast mineral wealth the Aegean Minoans may have come to their aid militarily to sustain the flow of metals. An influx of settlers from the burgeoning populations of the east may have reinforced the surviving Millarens to found the new settlements of the El Argar and advanced to secure the sources of tin in the Iberian interior by military force. It could be just a coincidence but the fall of the Millarens, the rise of El Argar, and the first use of bronze in Britain occur at about the same time - 2200 B.C. This may have been due to the beginning of a Minoan Atlantic tin trade with Cornwall in Britain (the Cassiterides?) 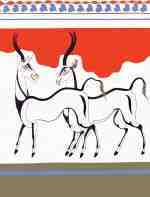 based from their Iberian El Argar colony to supply the markets of the eastern Mediterranean. The Minoan leadership in the Aegean would have to be strongly centralized, unified, and effective in order to implement these aggressive and sustained policies. They may have secured the supply of metals they desired but the friction and hostility that had been long brewing among the Iberian Beaker peoples would have been greatly exacerbated and smoldered into an evolving conflagration. The shutdown of the Kestel-Goltepe mines in 1840 B.C. may have been due to the Minoans flooding the market with cheap tin from the west or the mines may have simply run out of tin. 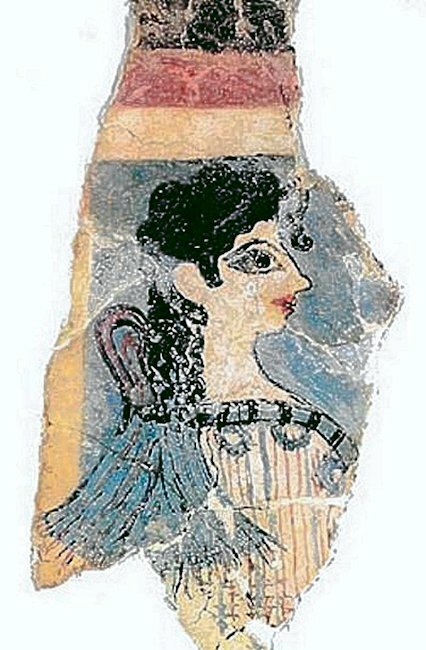 Whatever the case the Minoans controlled the price of tin in the eastern Mediterranean until something completely extraordinary occurred. In about 1630 B.C. the huge Theran (Santorini, Greece) marine volcano in the south-central Aegean Sea exploded with such colossal violence that it nearly destroyed the Minoans in the Aegean. The social dynamic constructed on economic imperatives had continued to build until the bubble was burst by the volcanic eruption that changed the world. 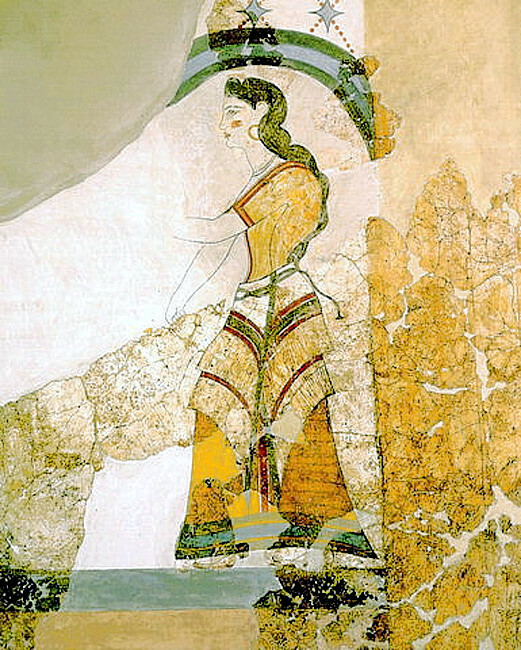 Several decades after the eruption the Mycenaeans from mainland Greece conquered the surviving Minoans in Crete and assumed control of the western maritime trade networks of metals from the west. The Iberian El Argar were incorporated and continued to function as an Aegean colony under the Mycenaeans. 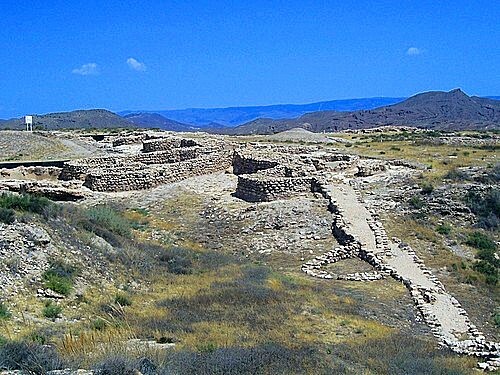 The Motillas (forts) of the Bronze of Levante culture like the Motilla del Azuer in La Mancha were probably Mycenaean era defenses for a "Tin Road" connecting the inland tin mines of Cardenas and Madrid with their ports in the southeast. 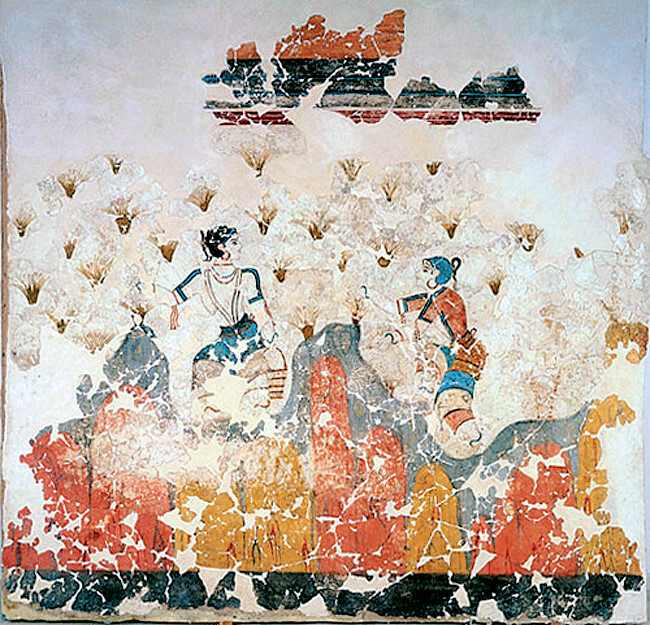 The Mycenaean El Argar era lasted for about two hundred and fifty years until its catastrophic collapse in about 1350 B.C. F. Molina, J. A. Camara, J. Capel, T. Najera, L. Saez. "Los Millares y la periodizacion de la Prehistoria Reciente del Sureste". III Simposio de Prehistoria Cueva de Nerja, 2004, Vols. II y III. Nerja: 142-158. 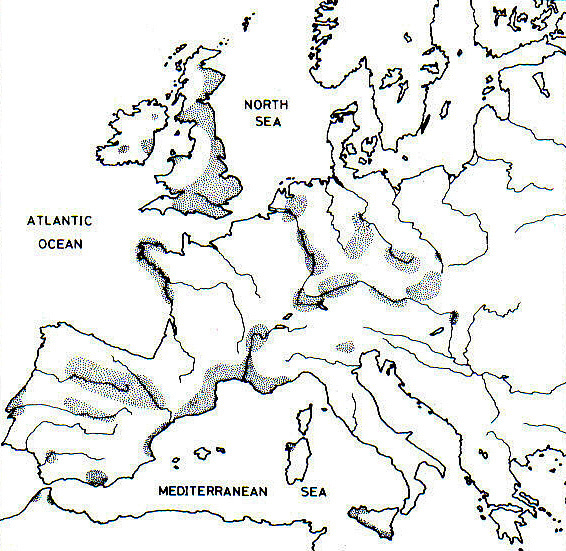 P. Diaz-Del-Rio, "Factionalism and Collective Labor in Copper Age Iberia", Trabajos de Prehistoria 61, n.o 2, 2004, pp. 85-98. The Foundation of the Hellenic World. 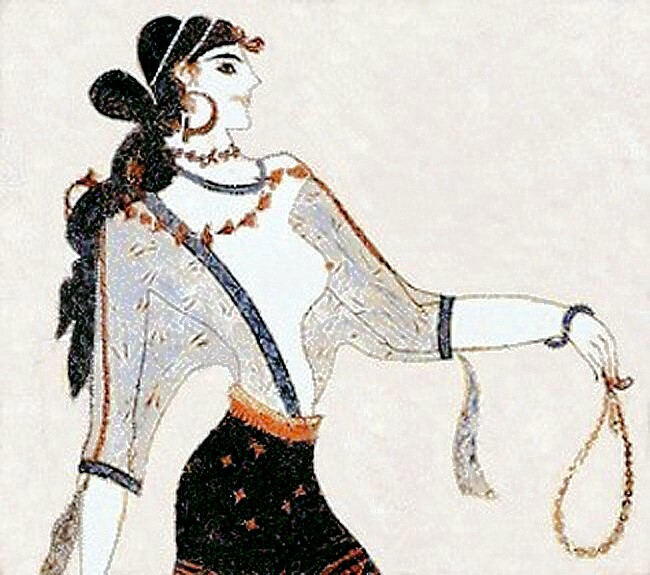 Neolithic Period in Greece. 2006. T. Douglas Price. "Europe's First Farmers". 2000. TASK - The History, Archaeology, Art and Cultural Heritage Foundation - TAY Project. Kurucesme Cad. 67/B, 34345 Kurucesme, Istanbul, Turkey. Philip P. Betancourt. "The Chrysokamino Metallurgy Workshop and Its Territory". The American School of Classical Studies at Athens. 2006. Joseph B. Lambert. Traces of the Past: Unraveling the Secrets of Archaeology Through Chemistry. 1997. Joao Zilhao. "Radiocarbon Evidence for Maritime Pioneer Colonization at the Origins of Farming in West Mediterranean Europe". PNAS, November 20, 2001, Vol. 98, No. 24, 14180-14185. R. J. King, S. S. Ozcan, T. Carter. "Differential Y-chromosome Anatolian Influences on the Greek and Cretan Neolithic". Annals of Human Genetics, 2008, 72,205-214. K. Aslihan Yener. "An Early Bronze Age Tin Production Site at Goltepe, Turkey". The Oriental Institute and the Department of Near Eastern Languages and Civilizations. University of Chicago. F. Nocete, E. Alexa, J.M. Nietob, R. Saezb, M.R. Bayonaa. "An archaeological approach to regional environmental pollution in the south-western Iberian Peninsula related to Third millennium BC mining and metallurgy". Journal of Archaeological Science Volume 32, Issue 10, October 2005, Pages 1566-1576. Jeremy B. Rutter. 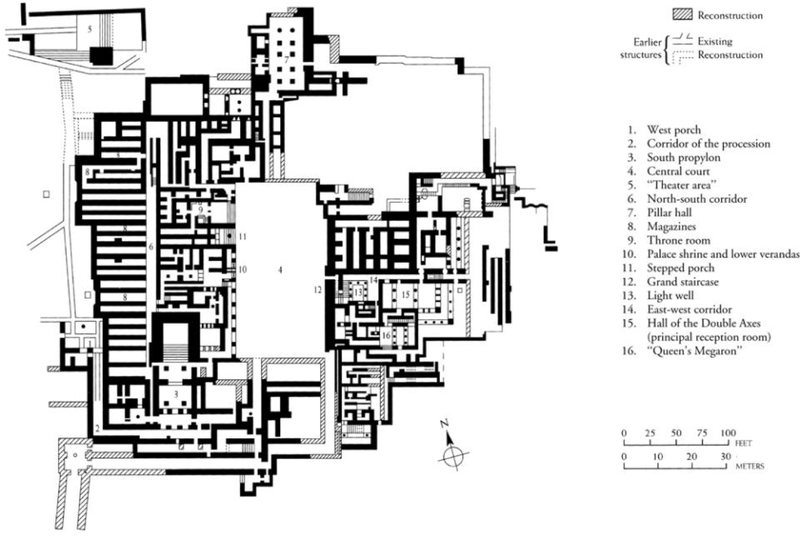 "Tholos Tombs of the Mesara". 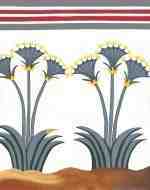 Lesson 6: The Early Minoan Period: The Tombs. 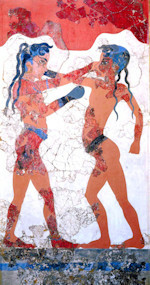 Aegean Prehistoric Archaeology. Dartmouth College. Stuart Swiny. The Earliest Prehistory of Cyprus, from Colonization to Exploitation. American Schools of Oriental Research. 2001.